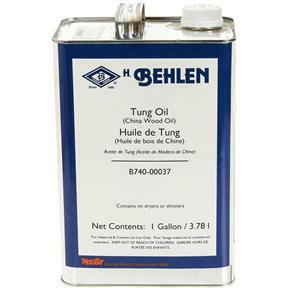 Behlen B740-00037 - Tung Oil, 1 gal. Pure, unmodified, unalterated. Also known as China Wood Oil and Nut Oil. The most water, caustic acid, heat and mildew resistant of all the oil finishes. Also, the most durable. Apply only to newly prepared wood. Tung Oil is also used to manufacture many different types of varnish. Due to Tung Oil's pure, unmodified, concentrated formula, a ratio of 4 parts Mineral Spirits to one part Tung Oil is suggested. Apply with a clean cloth.